I want to jump in here as someone relatively new to high end gear. I have a 270w/ch amp that has 2ohm, 4ohm, and 8ohm speaker outputs. My speakers are Sonus Venere 2.5s, and they have a 6ohm output. I've read up on whatever I could find via Google, but I've read so many conflicting opinions that I'm more confused now than I was before. I would think 8 ohm taps....but its an easy experiment to do....which one sounds best to you?? I had bought my daughter that new little NAD D3020 integrated. That has Bluetooth, so you can hook right up to it with any iPhone, etc. It sounds about as good as any sub-$500 amplifier (new). It also has pretty good power for a little guy. ...advice given to me by longtime, serious, money spending Audiophiles (think 1M+ in gear). They advise against used amps and receivers, that they will always have a $urprise in store. So, better to buy new with warranty, and return policy. That depends. 30 year old speakers, even 15 year old? If the surrounds aren't foam speakers don't really wear out, but newer designs can have better technology due to simulation tools becoming more widely available to designers. $1000 for a twenty-year-old amp? I agree with the $1m+ comments. Old and especially "vintage" stuff, you cannot count on longevity. But $40 for a receiver that is a few years old? Or the $100 Denon 2312Ci my friend got? Or the couple year old Onkyo 2-channel I got my friend ($30!!!) as a Hannukah gift? Eh, if something that cheap compared to the "new" price breaks, then who cares. And electronics which are just a few years old, if they are working they really aren't likely to break. Realize that it has been pointed out that almost NO stereo amplifier except a couple of those mentioned by @head_unit have a subwoofer out and bass management features. So Emotiva is in good company with thousands of amplifier manufacturer's since the creation of time. As such, I don't really think it should be pointed out as some sort of defect. I have yet to own any amplifier that was brought to it's knees by excessive bass being pulled out of an amplifier. Amplifier's by their nature reproduce sounds from sub-sonic frequencies all the way past the the upper limit of human hearing. I'm assuming, that in your lifetime, you have had the privilege of listening to many amplifier's. Probably none of those has bass management, unless it is an AV receiver. Mostly, it is not a good idea to put additional filtering on the output of any amplifier as it will have some effect on the sound, because it is in the signal path. It is possible to have an adjustable subwoofer output on an amp where the siginal that is specific to what you are going to connect to the subwoofer may be controlled by bass management features. The main full range signal is never messed with. Every speaker is going to have its own -3 dB point, which is where the bass response is no longer really flat. The reason that it is -3 dB as a reference is because at these low bass frequencies, our hearing is very insensitive to minor volume level changes that would be other wise apparent at .05 dB at a frequency of say 500-Hz. But just because a speaker's response is only considered to be "flat" to that -3 dB point, does not mean at all, that the speaker is not capable of producing bass a lot deeper than that. And, the louder you turn up your amp to listen, the deeper and stronger you will hear that bass. If an amplifier were to cut off bass abruptly at a certain frequency, than the natural response of the speaker would also be artificially thrown out of wack. Every speaker has a natural bass roll of that is unique to that particular speaker and should be left alone. And how well your ears are going to perceive that bass is volume dependent. How much bass your speaker is going to put out is also very dependent on whether or not it is placed directly on the floor or on some kind of stand. It is also heavily dependent on that speaker's position within your listening room and how the bass is reflected by room boundaries. Most AV receiver's and other electronic's that manage bass, do so in the digital domain, not the analog. So if you are really into a pure analog experience either with vinyl or with digital music, after the DAC, when the signal is now analog, you don't really want to convert it back into a digital signal in order to perform bass management functions on it. Your decision whether to buy Emotiva or any other amplifier should not be based on not having a bass management feature. None of my Emotiva amplifier's and none of my tube amplifier's offer a bass management feature. Consider many things in the purchase of an amplifier, but never the lack of a bass management feature. My current amp I bought used, my prior amp was a store demo (both from Goldprint audio). Previously I had a Parasound I bought off eBay. No problems to report. Not taking advantage of all the options makes little sense. Your money will go farther in the used market and will give you access to better quality components. Wow, I definitely appreciate all of the support guys. I have to say - when I was in trouble - I was like I have no where to turn!! (Wife hates hi-fi, yes, hates it). I appreciate all the encouragement and information. It's hard when you don't have endless amounts of money to blow on hifi. I want good music - not perfect (what does that look like?) - I think I will be happy with Speaker + combo that compliment eachother. Why I went with the Onkyo (clarity) + Elacs (warmer than the Dali). In my budget its hard to check all of the boxes. Now - I was going to live without the connectivity of my cell originally if it gave me nice clean power. I can add on a bluetooth optical unit to my amp down the road. I will try the Emotiva + Elacs. If that doesn't work - well time to start from scratch. That being said, as a 20+ year musician - I love tubes but boy are they expensive in hifi! If you buy this product and you do not feel that it meets your requirements, you may return if back to Emotiva within 30-days for a complete refund. This policy is a risk free trial. Purchase with confidence! I also love tubes, and they are expensive. One suggestion that I have is some of the early 1960's tube integrated amps which have been restored. The ones based on the EL34 family of tubes. They are relatively inexpensive both to buy and operate, as these tubes last a long time and are relatively inexpensive to replace. Something that so many people do not understand about tubes, is that most (meaning just about all) modern speakers are designed to sound their best using SS amplifier's, because that is what most people today own. If you own speaker like this, which have medium to low efficiency, then, tubes will not be much of a benefit for you. The SS amplifier's that I have shown you run speakers like these. Polk LSiM707's perfectly well. I would not even consider running these speakers with tube amps as they sound excellent with powerful SS amps. Mine are black, or as Polk refers them to as "Midnight Mahogany". They are the inside speakers the ones closest to the TV. The tubes amps, like the one in the photo, operate speakers like the ones on the right. Don't worry about tubes, there is plenty enough time for that down the road, for now, enjoy which ever speaker's and amp that you feel works for you. The Emotiva is pushing 50-watts into an 8-Ohm load and is designed to run into 4-Ohm loads, so it so should deliver about 75-WPC into a 6-Ohm load, which should be quite satisfactory, as Emotiva amps can deliver plenty of current. Either way, I will be fine. If the OP finds it to be under powered, then he can simply return it for a more powerful amp. With the OP's budget, I think he has made a fine choice and will enjoy his new equipment. I am not about $$$, I am about sound and listening enjoyment. While I do enjoy doing the gear thing and I really don't know much about bands and music, that doesn't prevent me from listening. To me, there is a deeply rooted enjoyable and fun thing about listening to music. No doubt. I get home an hour or two before my wife from work most days, so I get some time to crank music through my speakers, then I do another hour or so later at night with my cans. This is such a great thread, I'm happy to have you guys to mentor a younger dude like myself. I think the Onkyo is going back, here i come emotiva! Just remember the thirty day trial period. We did not select this piece of gear you did, and I thoroughly agree with your decision. But you can't buy audio equipment on specs. Spec's do help, as do reading reviews and obtaining opinions offered by your fellow forum members. That is what I do myself. So get your gear all together, listen for a week or two and make sure that it is right for you. If not, exercise your option to return either or both of them. New equipment that I generally recommend do come from sources that offer some sort of return policy. Nothing wrong with extra juice. But once you hit 75-Watts, if you double the power of the amplifier, you are only going to gain an extra 3 dB increase in volume, which is only mildly perceptible. Yamaha list its minimum RMS power as 85-Watts (into 8-Ohms), which is only 10-Watts more than the Emotiva's rated power. They also list "High Dynamic Power" which I take as some marketing hype, as it is not a recognized term in the audio business. Which can mean anything they want it to mean, being an undefined term. It is certainly put there to sound impressive. Keep in mind that the majority of gear like Yamaha's, Dennon's and similar units are being sold through big box stores and by box box store salesman. Noting that this term is neither explained nor is it defined in the Overview or Feature's page on Yamaha's own web site. Convenient? Throw out a term and then offer no explanation for it whatsoever? I like and have owned numerous Yamaha and Marantz gear over my audio lifetime and don't have any issues with their gear. Since the first piece of Emotiva gear that I have purchased, I consider it to be far and above superior to ANY amplifier that I have previously owned in my audio lifetime. Which is why my XPA-2 (generation I) continues to sit in the same exact spot and perform the same exact function as when I bought it, back in 2012. Emotiva is one of the first company's to offer an Internet Direct sales model. 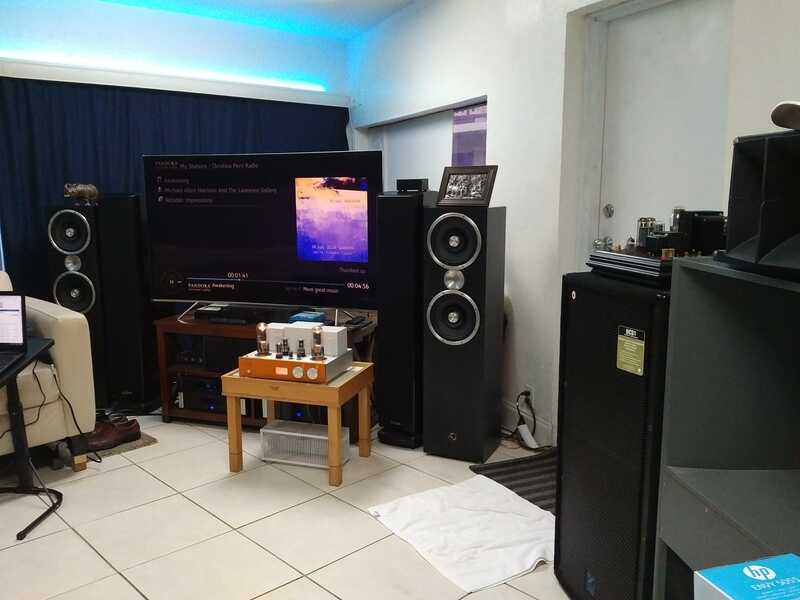 Their success in the market against today's major big box audio retailer's is because they are offering better products and at a better value than either the big box stores or traditional audio dealers with excessively marked up products. Because, the Internet Direct model does not provide for a traditional dealer auditioning experience, they offer a no-risk 30-day no-hassle return policy. I think their continued success, does speak for itself. But, you will have to also have them run with the Emotiva to discern this. I really doubt that you or anyone else would need anywhere this wattage to power these speakers or most any other speakers. I have nothing against power. large modern tower speakers that are designed to run with SS amplification do benefit from a lot of power. For this reason, I run my front towers, which are currently Polk LSiM707's off a 250-Watt Emotiva class A/B/ power amplifier. I could clearly hear the difference back when I was running Polk's entry level Monitor 70's series II speaker's. The Peachtree Nova and iNova is rated at 80-Watts, but if you look carefully, that is into a 6-Ohm load. I was never happy with that amplifier. Not necessarily unhappy but never quite happy, which is what moved me to buy the XPA-2 in the first place. Besides, it happened to be on sale for $690, so that gave me a bit of a nudge. Note that the Monitor 70's are some good size cabinet's that have a nice, four 6.5" mid/woofer's and play down to 40-Hz. at their -3 dB point and are 8-Ohm Speakers. The power of the Peachtree amp is about 65-watts at 8-Ohm's. Now, since I listen to them daily at volume levels not even close to even 2/3 volume, that would not seem to be an issue. After buying and bypassing the power amp section of the Peachtree, in favor of the XPS-2, even these inexpensive speakers really popped, sonically speaking. Even guests who would enter through the rear door to my office and could not see the new XPA-2 would comment about how much better the office stereo sounded. To this day. I only use the iNova as a central point of control. I control the source selection with it, use its internal ESS Saber DAC to decode all digital information in the system and its class "A" preamplifier. I never use its power amp section. All of my power amps are outboard power amps with solid power supplies, relative to the size of the amp and all of them can deliver their rated power into a 4-Ohm load. Let's see what the OP observations are with the Emotiva. We really don't know an exact comparison of the power supplies in either unit. I really am a believer, that it is not so much as to how powerful that power is that an amplifier is rated at, as much as how well built the amps power supply is and how much energy it can store up and deliver, that makes the most difference. Tube amplifier's are generally not that powerful. The tube amp that I am using to drive the A7's, is only rated at 22-Watts. Always people are referring to a seemingly way under powered tube amp as being to get the job done, because they are tube Watts. In actuality, Watts are Watts, they are a definable amount of energy. There is no such thing as tube Watts being any different than SS Watts. But lower powered tube amplifier's do seem to be stronger and produce more volume than most equivalent SS amps. But take a look at my 22-Watt SET amplifier, which weighs 77-lbs. Compare that to to a modern SS amplifier of the same Wattage (if you can find one). How big and heavy would that 22-Watt SS amplifier be? Not very big and not very heavy. The power supply in tube amplifier's together with their output transformer's are vitally important to the performance of a tube amp of any quality. They are huge as compared to a SS amp of the same rated power output. The Emotiva EPA-2 has a huge power supply, which, together with the heat sinks account for the lion's share of this power amplifier weighing in at 72-lbs. The problem with a lot of modern day receiver's is that they don't have the massive power supplies that vintage SS receiver's had. Compare the weight of a 40-Watt SS receiver from the early 70's to a SS receiver with the same wattage, that is manufactured today and see the difference. The only true test would be to be able to evaluate the Yamaha next to the Enotiva together, to determine which as both enough power and how both deal with the micro-dynamics when running the stereo at lower power levels. This is more of a real world listening test then comparing the published power ratings of either amp. Let's see what the OP has to report? Sooooo subjective.. I prefer VINTAGE! RadioheadMario, StateOfTheArt, Eigenvector and 1 other person like this.